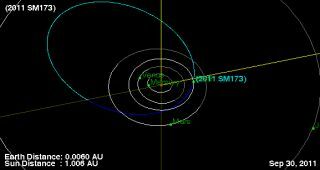 This NASA diagram shows the orbit of newfound asteroid 2011 SM173, which flew within 180,000 miles of Earth on Sept. 30, 2011. The asteroid was discovered a day earlier on Sept. 29. A small asteroid zipped by Earth well inside the orbit of the moon today (Sept. 30), the second space rock encounter for our planet this week. Both asteroids posed no threat to Earth, scientists say. "Small asteroid 2011 SM173 just passed Earth at a safe distance of 180,000 miles (290,000 km or .8 lunar distance)," scientists with NASA's Asteroid Watch program announced in a Twitter post today. The 33-foot (10-m) wide asteroid 2011 SE58 slipped within 147,000 miles (236,573 km) of Earth during an evening flyby on Monday (Sept. 26), according to Asteroid Watch scientists. The average distance between Earth and the moon is about 238,900 miles (384,402 km). Both asteroids were too small to threaten Earth with a serious impact. If they had barreled into Earth, they likely would have burned up completely in Earth's atmosphere, the researchers said. "Rocky asteroids the size of 2011 SE58 are not considered hazardous as they break up in the atmosphere & cause no ground damage," Asteroid Watch scientists wrote. Asteroid 2011 SE58 was discovered by skywatchers on Sept. 21, according to database maintained by NASA's Jet Propulsion Laboratory (JPL) in Pasadena, Calif.
By coincidence, the asteroid flybys this week occurred just as NASA announced the latest results from its efforts to find the largest near-Earth asteroids, objects that could potentially endanger Earth. NASA's asteroid census has discovered about 90 percent of the largest near-Earth asteroids and revealed that the population of mid-size space rocks (asteroids about 3,300 feet, or 1,006 m, wide) is far lower than previously thought. Scientists with NASA's Near-Earth Object program at the JPL have said that small asteroids like 2011 SM173 and 2011 SE58 can be expected to pass by Earth on a daily basis. But the asteroids pose no threat to the planet because of their small size. Bigger asteroids — those about 460 feet (140 m) wide — can cause widespread damage around their impact sites if they slam into Earth. But it would take a strike from a much larger space rock to cause global devastation, scientists have said. On Thursday, NASA announced that there are fewer of those giant asteroids in the solar system as well. Astronomers initially estimated that there were about 1,000 mountain-size asteroids in orbits that brought the space rocks near Earth. Using the WISE observations, scientists were able to lower that number to 981, with 911 of those asteroids already known and well-tracked. NASA scientists and astronomers around the world keep a constant watch on the skies for potentially dangerous asteroids. The next object expected to fly close by Earth will be asteroid 2009 TM8, which will pass just inside the moon's orbit when it flies by. The asteroid last whipped by Earth in 2009, when it came within 216,000 miles (348,000 km) of the planet. Asteroid 2009 TM8 was discovered by skywatchers shortly before its 2009 flyby. It is also tiny, measuring just 30 feet (7 m) across, and poses no threat to Earth, astronomers have said.